An aspect that is strong enough to pull two people together may not be adequate for the relationship to develop. You meet a new love interest. Fortunately, they’re open-minded when you ask them for their birth information. Data in hand, you go to an astrologer or pore over the synastry contacts yourself. 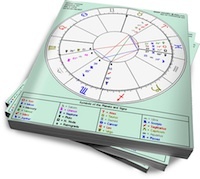 There are definitely a few aspects that point to a significant relationship developing, but there are also a few aspects—classic examples of what to look for in relationship synastry—that although powerful enough to pull two people together, are not adequate by themselves for the relationship to develop: planetary overlays to the Seventh House, and contacts to the Nodes. These may feel like sure things, but It’s always a good idea to look at their flip side. I believe this discourages people from seizing onto one or two aspects and making a declaration about the entire relationship. The Seventh House is considered to be the house of marriage. If someone’s planets land there, it must mean they’re your future partner, right? Actually, no. The Seventh House represents projected ideals about a partner. In addition, although house overlays are felt by both people, it’s the “house” person who views the “planet” person as partner. For example, let’s say Kelly’s Venus falls in Brad’s Seventh House. Kelly’s way of relating to another person fits Brad’s partnership ideals. He thinks that she’s exactly what he’s looking for in a spouse. Kelly will be aware of Brad’s feelings, and will definitely react to them. How she reacts is decided by his impact on her chart. Let’s put Brad’s planets in Kelly’s Tenth (career), Eleventh (friends) and Third (communication) Houses. Other planetary contacts may indicate attraction, but these house overlays are platonic. Chances are that Kelly will view Brad as a friend who she can talk to and who has an impact on her career. This doesn’t mean that Eleventh House overlays will always be romance dealbreakers. With other romantic/sexual contacts between them, Kelly could view Brad as a friend and lover, simultaneously. My point is that the impact on each person’s chart has to put them on the same page. So what is north and south nodes are conjunct each other in synastry? Is that the ultimate alignment for helping purging past mistakes, thereby both progressing both forward? Or is it a deadlock? I’ve been trying to figure this out since I have this with someone I am currently seeing. As usual, you illuminate so much through your writing. Thank you, Nadia. I am just coming out a rather turbulent relationship with a Scorpio sun/Libra moon whose moon, Mercury, Uranus, and pluto conjunct my north node while my Sagittarius sun, Venus, and Neptune conjunct his. It was a very intense relationship that I’ll greatly remember. It was at times very scary and uncomfortable but I learned much about myself that is helping me to grow. However, given the nature of our relationship, I’ll always wonder if I’ve had the same effect on him. North and South Nodes conjunct have strong potential to help each person evolve. Whether each person embraces this or sits in a deadlock really depends on which signs and which houses the nodes are in and all the other aspects between the two charts. It’s helpful to figure out the lessons each person has to learn in this life time first (go back to the natal chart) and then see how they blend together. And when you say conjunct , if we are talking about the Nodes conjunct each other it’s more significant if there is a really tight orb (say, two degrees at the most) between the Nodes. Wow…yes indeed, your relationship is a prime example of two people finding each other in order to move forward in this lifetime. I would say yes, absolutely, you had the same effect on him. If you are comparing the intensity levels, your Neptune will probably not create as much upheaval as his Pluto/Uranus initially. Neptune works a little differently in that the affects almost sneak up on you. He may notice the effect gradually or on a sub-conscious level but it will be there. Otherwise, both of you had personal planets conjuncting the others NN which always has a huge impact. Thank you for another very relevant aritcle. My Cancer Moon is <1° conjunct my SO's 2nd house North Node (loosely opposing his BML in 8h Capricorn!). He was indeed very frightened of his feelings toward me. It took nearly a year for him to let his guard down – which only came with my ultimatum for moving on with my own life. We've been together for 2 years now. It is crystal clear we are here to learn and guide each other. Oh, I too have Cancer North Node – square his Vertex and Pluto down to the minute! LOTS of learning about trust, committment, family and faith. Your point about the other factors, i.e., transits is well taken. He has Venus, Sun, Saturn, Pluto and Vertex in Libra. Saturn is just now touching his Venus. I can't help but wonder how our relationship will make it through this VERY stressful time. Once the bond was forged, neither of us could see an end to the connection. It feels lifelong – my Saturn trines his Libra stellium. Thanks for more invaluable help in relationship astrology. how much are your relationship chart readings? and how do you go upon doing them…phone? email? letter? If I am interested how can i reach you for it? thank you! While transiting Saturn can be stressful it can also be positive. In your case, transiting Saturn over his Libra stellium will also trine your Saturn…..
You can also email me directly at nadia@rubyslipper.ca. I actually have problems understanding the seventh house. At first, I thought its all about marriage, but then again, I was wrong. Thanks for clearing it up Nadia! Kudos! so what’s the allowed orb? is 5 degrees still acceptable? someone I like has his North Node in 5 degrees sag, and my mars and jupiter are in 0 gemini, does that make his south node conjunct my mars and jupiter? My birthday is July 13 1990 @ 5:18am Johannesburg S.Africa. It’s a brilliant reference. Any conjnct to my Sun and thus Jup will oppose my Saturn which opps jup by a few minutes and a conjnct to my asc, will do the same to my Venus but square my moon. How does one go about dealing with these aspcts? A Scorp, Sag, Leo asc lady? jup+Sun+merc+Venus in scorp and sag moon+mars+N.Node? My N.Node= her 7th. Dam Jupiter influence not enough space, haha. Hi Nadia, is it better to have many compatible aspects or one very good one and a few oppositions and squares. I’m talking Her mars and ascendant conjunct his Sun, Jupiter and Chiron. His moon trine his Sun by minutes. Venus in the same sign. Her Venus on his ascendant by 2 degrees. His mercury conjunct her Jupiter opposite her Saturn. Sun Sextile Sun. it sure feels like we married already although we just friends. There’s a lot of empathy but no real spark. My N. Node is in her 8 and hers in my 7th. We attended primary and high school together. Met recently after a few years. She makes references to herself that I’ve written idyllicaly about in poems for ages. How would she have known? I really need some help with this one, a relationship that has been in my life for almost 20years, we are so drawn to each other, but when one wants to move forward with the connection it seems the other has fear and vice versa. We go in cycles of being in each others life and then not. It is a very powerful and magnetic connection but Im still trying to understand the meaning of our connection. The main thing that I am confused by the meaning of and would SOOOO appreciate anyone’s help on is this. Anyone have any idea what this means when there is both South Node and North Node contacts in the synastry? My South Node conjuncts his IC point exactly. There is more but these are the main ones I can see. Any help with this is appreciated as it has been a riddled Ive been trying to understand for over a decade!